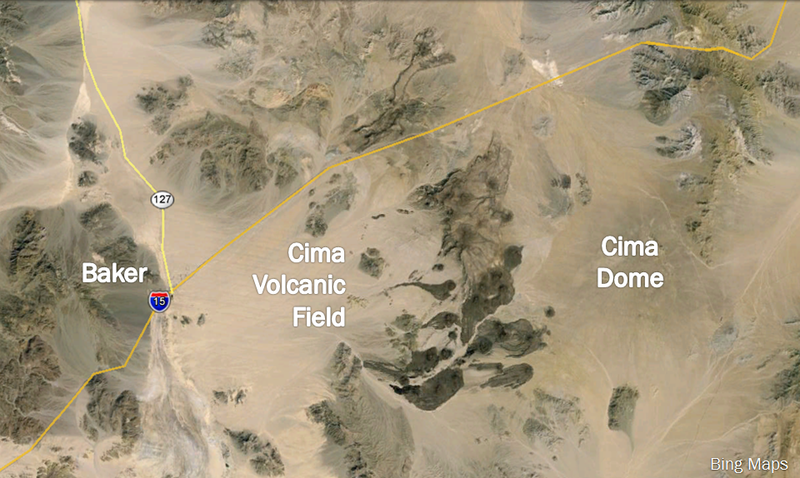 ﻿﻿Just east of Baker, California near Interstate 15 is the Cima Volca﻿nic Field. Our group entered through the southwestern corner of the field. Unfortunately, we only had time to visit Cone F, but it was a great chance to see some relatively well-preserved igneous features. A cinder cone is essentially a big conical pile of pyroclastic debris, or pieces of cooled lava that were ejected into the air and cooled as they fell back to the ground. HOW IS A CINDER CONE BUILT? 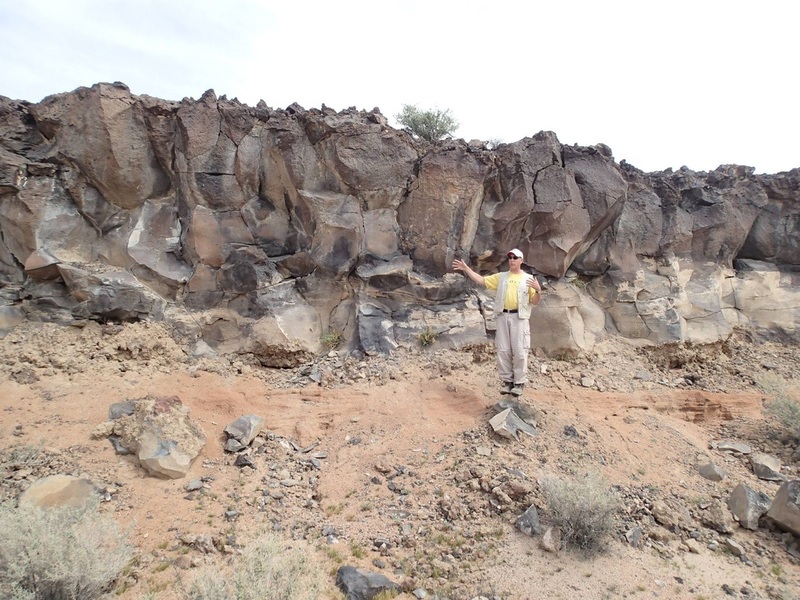 Take a look at the slideshow below to see how a cinder cone is formed. These cones are basaltic in composition (mostly olivine basalts and basenites). Structurally, the cones are comprised of thick layers of cinders (<15 cm) and bombs (few cm - 2 m). The field extends both to the north and south of I-15, though the cones from the most recent eruptive period are on the southern side. There are over 30 cones within the newest field. They can be identified by their westward pointing flows which followed the regional westward dip of 5-7 degrees caused by the Cima Dome intrusion. Many different types of igneous features can be found in the Cima field. 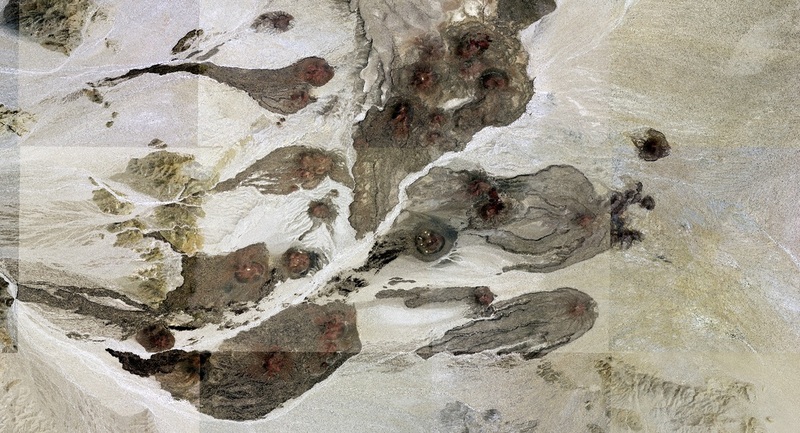 The lava flow pictured above has several distinct parts. The top has smaller chunks of rubble, resembling an a'a flow. Gas bubbles can be seen in the upper parts. The orientation of these gas bubbles can be used to determine the direction in which the lava flowed, as the bubbles will have been stretched in the same direction. Most of the lower part is massive, or without any internal structure. The lowest part of the flow is made up of autobreccia, or a breccia made from pieces of the flow itself. Baked sediments lay underneath, formed by the heat of the still-molten lava as it flowed over it. Lava tubes form when the outside surfaces of streams of low-viscosity lavas (like the basalts that make up the cinder cones) cool and form a hard outer shell. This forms an insulated tube that helps keep the lava beneath it molten as it drains away from the source. After it has all been drained, the shell is left behind, forming cave-like tunnels. Feeder dikes, rootless flows, and lava ponds can also be seen throughout the field. While most of the weathering and erosion is from natural forces, humans have made their impact, too. Though the field overall is relatively young, geologically speaking, it has still been subjected to quite a few changes. The dry, desert conditions present in the area today have not always been around. This representation of the change in paleoclimate over the past 1.2 million years shows that that the Mojave Desert wasn't always so dry. Glaciers of the last Ice Age extended down far south far enough to influence the climate of the Mojave region, allowing perennial lakes to form. 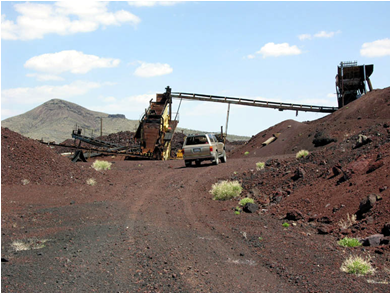 In many areas around the Mojave region, cinders can be seen being used in a variety of materials, including roads, landscaping, and even barbecue briquettes. 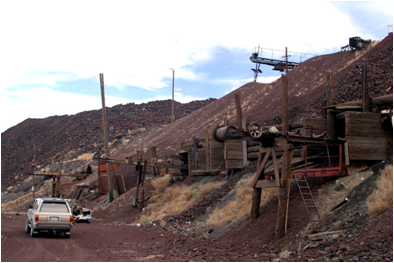 One source of these cinders could have been the Aiken Cinder Mine, which operated from 1948 to 1990. Much of the equipment that was once used to move and process cinders was just left behind. In an aid to help protect such a unique area, the Cima Volcanic Field became part of the Mojave Wilderness Preserve under the Wilderness Act passed by Congress in 1964. Dohrenwend et al., 1986 conducted a study using﻿ ﻿﻿Potassium-Argon (K-Ar) dating﻿ ﻿﻿to estimate ages for 11 of the cinder cones. Included in this study was the collection of morphometric parameters from the field. One of the goals of the trip to the Cima field was to collect current field measurements of the height and basal width of one of the cones (Cone F). These would be compared to the values of three other cones (A, E, and G) collected in the previous study as well as values derived from Digital Elevation Models (DEMs). Five teams, each with a GPS unit were used to collect waypoints around the cone; two around each side of the base and one along the rim. The waypoints were imported into ArcMap and were used along with the DEMs to collect height and width values. The field values collected for Cone F were somewhat consistent with those collected in 1986, as were the values collected from the DEMs. As such, the h/w ratios calculated from the new values were similar, but had quite a significant margin of error. However, the relative plots of the h/w ratios of the cones were in an almost identical order. In order to produce a more comparable set of results, more cones in the field would need to be investigated. Experimentation and improvement upon the method used for defining basal perimeter in the digital data would be useful as well. Continuation of this research could also look into using different resolutions of DEMs or different types of remotely sensed data. Refinement of this method of relative age dating would be useful as it could be used in other remote areas here on Earth or potentially on other planets. For more information, check out these sources.